This is perhaps the most sought after birds in the world. People have hunted the Lesser Birds of Paradise (Paradisaea minor) since hundreds of years ago. Because of the continuous hunting, it is now facing extinction in several parts of New Guinea or West Papua forest. In 1980s, they could still be seen in the jungle of Table Mountain near Manokwari town. Today, I cannot see or watch the birds in that jungle anymore. Although Table Mountain is protected by the Department of Forestry of the Indonesian government, it is facing constant destruction from the town dwellers. Hunters carrying air guns like to go into the jungle of the mountain to shoot cuscus, soa-soa (monitor lizards) and birds. After searching the birds since 2010, finally, I was able to find their dancing site located in the territory of Susnguakti forest. It is a 1-hour ride from Manokwari town. There are four or five trees that have been chosen by the birds of paradise as the place where they perform courtship dance in the mornings and in the afternoons just before sunset. The trees stand on a hill with steep slope. I've got a blurred photograph of the male that I shot using Nikon Coolpix P500. I hope that I can make better pictures in the future. 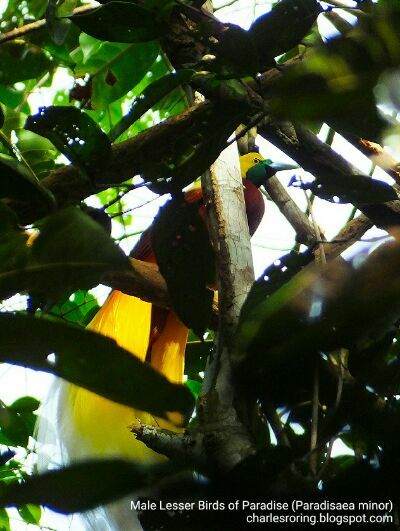 As a nature lover and eco-tourism enthusiast, I try to protect the area by offering birdwatching tours to tourists who want to watch birds of paradise. I hope that this environmentally friendly eco-tourism scheme will help local Papuan villagers generate alternative income that can replace their present livelihood. 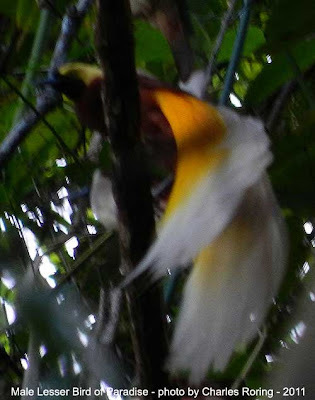 In addition to the Lesser Birds of Paradise, Susnguakti forest is also the natural habitat of King Bird of Paradise, Magnificent Riflebird, Hooded Butcherbird, Rufous-bellied Kookaburra, Coconut Lorikeet, Beautiful Fruit Dove, Common Paradise Kingfisher, Papuan Frogmouth. Animals such as snakes, soa-soa monitor lizard, large ground brown skink, Papua Dragon Tree Lizard, blue-tailed lizard, Cruiser Butterfly (Vindula arsinoe), the Silky Owl Buterfly (Taenaris catops), Swallow tail blue mountain butterfly (Papilio ulysses) butterflies, beetles and fireflies can also be found in this forest. A lot of species of plants in the jungle of this Arfak mountains including bamboos, big trees, orchids, and glowing mushrooms. 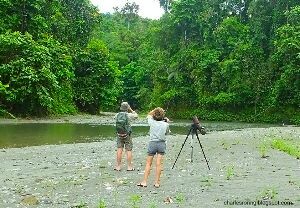 If you want me to organize your birdwatching and wildlife tour in Manokwari, Sorong, Tambrauw Mountains, and Raja Ampat, please, contact me by email to: peace4wp@gmail.com. There is a river in northwest region of Manokwari. Its name is Mesirrokow. It is covered by tropical rainforest that has become the natural habitat of a lot of species of birds such as eclectus parrot, sulphut crested cockatoo, palm cockatoo, blyth's hornbill, coconut lorikeet, yellow capped pygmy parrot, pink spotted fruit dove and many others. There are paradise birds in Susnguakti forest of Manokwari. Some of them include: Lesser Birds of Paradise, King Bird of Paradise, and Magnificent Riflebird. Common Paradise Kingfisher, Rufous-bellied Kookaburra, Blyth's Hornbill, Hooded Butcherbird can also be seen in the forest. As a matter of fact, birds are not the only animals visitors can watch in the forest. There are also cuscus possum, Papuan dragon lizard, snakes, Large Ground Skink, bandicoot, and colorful butterflies, fireflies that could be watched in this lower montane forest of Arfak range. Tourists who want to go to this forest have to be physically fit. It is located between the regencies of Manokwari and Sorong. Most of the mountains are covered by pristine rainforest that is the natural habitat of a lot of species of tropical birds such as paradise birds, parrots, fruit doves, kingfishers, pigeons. The regency of Tambrauw can be reached through Manokwari city and Sorong city. Because the cost of traveling to Tambrauw mountains is expensive, I highly recommend that tourists come to this region in a group of at least 3, 4 or more people to share the cost. There are some equipment that visitors can bring in order to enhance their birding and wildlife watching experience. In general, birders bring binoculars. From my personal view, a pair of Swarovski EL 8.5×40 or Swarovski SLC 10×42 WB binoculars produces sharp and crisp images of birds, wild animals and unique wild flowers that we see through them. There are also Nikon Monarch 5 10×42, and the very affordable Visionking 10×42 mm binoculars. Sometimes I see birders bring spotting scopes. I used to try a Swarovski ATX 30-70×95. It was a very powerful birding gear. However, it is also expensive. 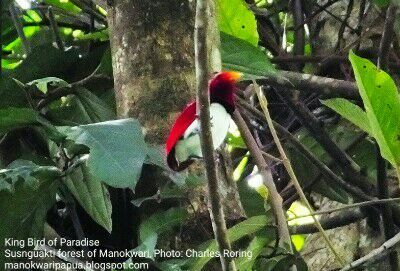 How to get to birding sites in Manokwari and Tambrauw Mountains? First, fly from your country to Jakarta - the capital of the Republic of Indonesia. Second, take a domestic flight served by Sriwijaya Air, Garuda, NAM Air, Lion Air or Batik Air to Manokwari city. Contact me by e-mail to peace4wp@gmail.com or by whatsapp to +6281332245180 before arriving in Sorong so that I can give you detailed info of tour price. I will meet you at the airport. I will arrange a 4WD car and all the necessary logistics that will bring you to Tambrauw. If you still need detailed information about rainforest tours and birdwatching trips in Tambrauw, you can still contact me at e-mail address. I am sure that you will have a great adventure in West Papua's rainforest. I frequently see Blyth's hornbills while trekking in the jungle around Manokwari. The best spot to watch this bird is in the lowland forest. In West Papua, we call it taun-taun. It is big that likes to eat fruits from nutmeg and ficus trees. 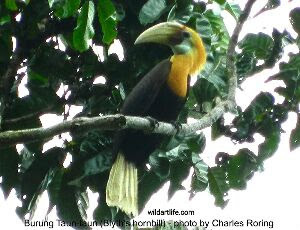 Blyth's hornbills and other birds play a very important role in the ecosystem of rainforest. They disperse seeds of the fruits that they eat. They can fly in a group of two, four or even thirty birds. I organize birding tours to rainforest in West Papua for birders who want to see hornbill and a lot of other tropical birds that are endemic to this region. Hornbills like to sleep in high trees after sunset time. In order to avoid predators, perhaps snakes, Blyth's hornbills choose the tip parts of the twigs. The one below is a male. I have guided birdwatchers from Europe, North Americas, Asia and Australia to watch Blyth's hornbill in Manokwari, Tambrauw Mountains, Sorong and Raja Ampat islands. The best times to watch birds are in the mornings and in the afternoon before sunset. I and some of my friends built basecamps deep in the jungle for birdwatchers to stay for several nights in the tropical rainforest of West Papua to watch birds and other wild animals such as cuscus possum, wallaby, deer, soa-soa lizard, butterfly, beetles, and etc. If you are physically fit, then you can take a birding tour with me to Tambrauw mountains. I have seen various species of tropical birds there. Some of them that I can identify are the Lesser Birds of Paradise (paradisaea minor), King Bird of Paradise, Palm Cockatoo, Sulphur Crested Cockatoo, Eclectus Parrot, Yellow-capped Pygmy Parrots, Variable Goshawk, Western Crown Pigeon, Oriental Dollarbird, Yellow-faced Myna, Golden Myna, Pinon Imperial Pigeon, and etc. In addition to animals, visitors who take a birding and wildlife watching tour with me can also see a lot of unique plants in the villages and forest that we visit including banana, papaya, mango, jackfruit, matoa, durian, and rambutan trees. Wild flowers such as Faradaya splendida, terrestrial orchid spathoglottis plicata, or various colors of hibiscus can be seen in the region. If you live in the United States or in Europe and want to watch birds in Manokwari and its surrounding forest, first, you need to fly to Jakarta - the capital of Indonesia. Second, you take a domestic flight served by Sriwijaya Air, Batik Air or Garuda to Manokwari city. I will meet you at the airport and organize your bird and wildlife tour to Tambrauw mountains or to the nearby lowland forest. Here is my e-mail: peace4wp@gmail.com and whatsapp number: +6281332245180.